Click on Happy Christmas for video of SWW singing a Christmas SONG ???? Guess who are the five cyclists !!!!! Ho Ho Ho Have a Wheely Happy Christmas. 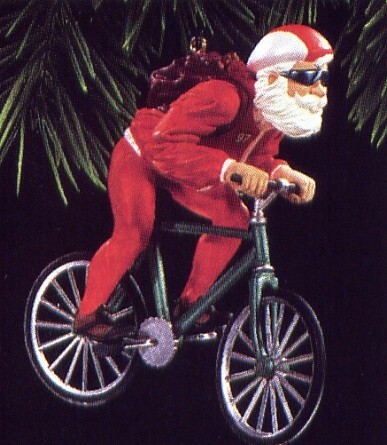 Ho Ho Ho Have a Wheely Merry Christmas and a Happy Cycling New Year. Road Cycling will restart after Christmas but we are planning a Club Spin 28th December Wednesday morning at 9pm one group of guys and gals at a slow pace short enjoyable spin. Anyone interested?????? 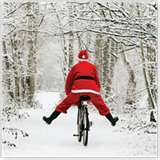 We are also planing a mountain biking day on the Ballyhoura Trails on Thursday 29th December. Underage SWW Cycling helmets are now available in Kilmallock Cycles. Fundraising bag packing weekend for SWW underage cycling is being held on Friday December 16 and Saturday December 17 at SuperValu Kilmallock. Your support to the future of cycling is welcomed. Southside Wheely Wheelers Cycling Club would like to wish all our club members a Happy Christmas and a very Happy cycling New Year. 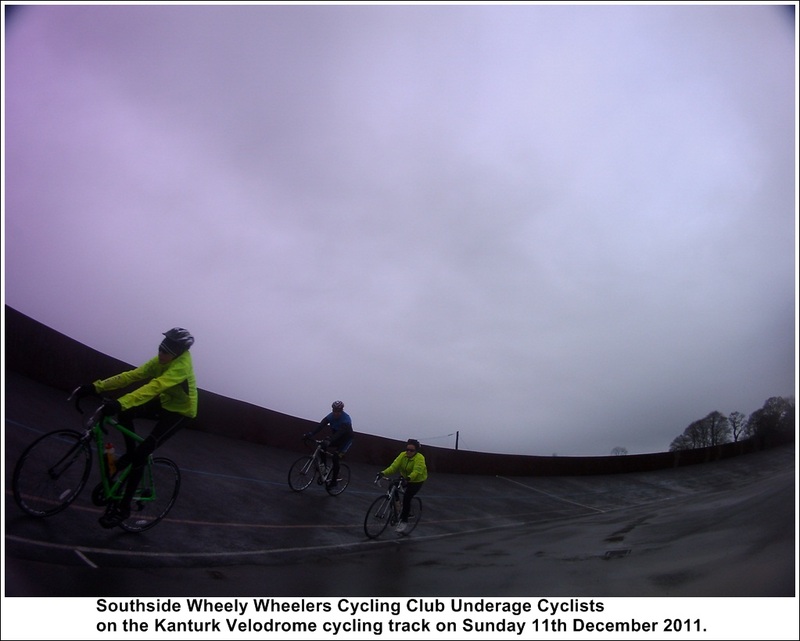 Southside Wheely Wheelers Cycling Club underage cyclists went to a 2 day training / coaching camp on Saturday December 10 and Sunday December 11 in Kanturk. Our under 16 cyclists completed a 60kms training cycle on Saturday with at an average speed of 30kms. 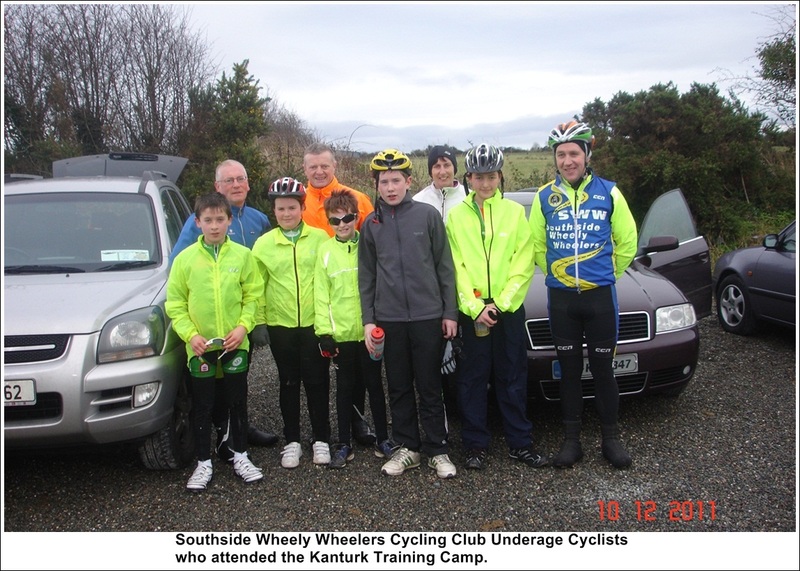 Our under 14 years and under 12 years were also attended the Kanturk training camp and enjoyed group cycling. Cyclists enjoyed a deserved evening meal after completing an enjoyable day on the bike. On Sunday our club underage cyclists were training on the new cycling track in Kanturk. Intense speed training on the outdoor velodrome cycling track was supervised by cycling Ireland coaches, members of the Kanturk Cycling Club along with our own Southside Wheely Wheelers Cycling Club coaches. The wet conditions could not dampen their spirits and they all enjoyed the weekend cycling. Cyclists who attended the Kanturk training camp were Aaron Walsh, Brian McCarty, Eoin Murphy, Eve Ryan, Thomas Manning, and Cain Lynch. Special thank you to club coaches who helped in Kanturk, Jan Murphy, Tagdh Murphy, Owen Tobin, Willie McCarty, Paul Gammell and Daithi Creedon. Weekly Underage cycling training also continued in Kilmallock at 3pm Saturday December 10 and our young club cyclists had a very good training session and sprint training session. Wheely well done to Mark Mullins, Aaron Passmore, Kate Passmore , Colm Hayes, Jamie Harte, Stephen Sexton, Brian Sexton. This week’s instructors were Paul Gammell and Mike Sexton. Wednesday Night Light Cycle was a hugh success with 3 groups our enjoying the thrill of night cycling. The evening was cool but the pace was hot as cyclists completed laps of the Kilmallock Quarry Hill circuit in dry cool but enjoyable cycling conditions. Next Wednesday 14th December will be our last Wednesday Night Light cycle before Christmas. We would like to thank all the Wednesday Night Riders for cycling every Wednesday evening and making night light cycling wheely great fun, we hope to restart in the New Year. Wheely well done to Ger Finn, Michael Reale, Jerry Ryan, Willie McCarthy, Mike Sexton, John Carey, Robert Shanahan, Sean Burchill, Paul Gammell, Edmond O’Reilly and Brendan Houlihan. Saturday December 3 Southside Wheely Wheelers had two groups out cycling, one group met at 8am and the second group met at the later time of 9.30am. Cyclists met on a very cold morning with freezing minus 3deg tempetures. Cyclists enjoyed a fast cycle and would you believe it, we also had time for a walk as we reached very icy roads near Ballagran, so off the bikes and legged it off down the road to the amusement of passing motorists, who ever said cycling was boring. Out enjoying the walk and cycle were Paul Gammell, Mike Sexton, David Kelly, Michael Gammell, and Jerry Ryan. Sunday December 4 at 8.30am cyclists met at the car park next to Kilmalock Cycles. Two groups left Kilmallock and completed an 80kms training spin to Knocklong, Ballylanders, Mitchelstown, Glanworth, Kildorrery, Ardpatrick and home. Sunday was a recipe of tough cycling, adding strong winds to horizontal rain on hilly roads suggests that our club cyclists are made of stern stuff no matter what the weather throws at us we push on regardless. Wheely well done to Owen Tobin, Pat O’Donnell, Shane O Brien, Stephen Finn, Brendan Houlihan, Dave Walsh, Jimmy Lillis, John Carey, Mike Sexton, Aaron Walsh, Willie McCarty and Tagdh Murphy. Congratulations to club cyclist Daithi Creedon who completed the Waterford Half Marathon in 1hr 45mins. Wheely well done Daithi, it goes to prove that cyclists can run as well as cycle. A.G.M. Monday 12th December at 8pm. 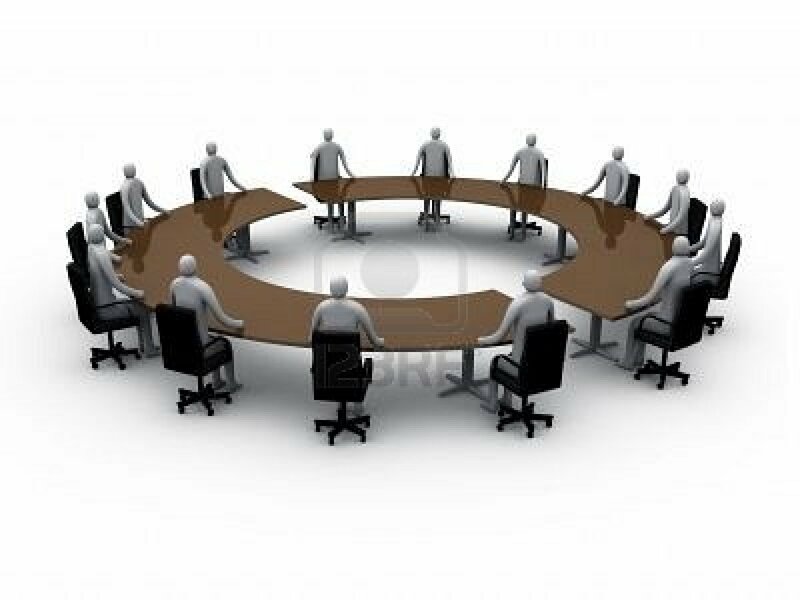 Annual General Meeting will be held in the Derbert Hotel next Monday 12th December starting at 8pm sharp. Meeting Room upstairs. 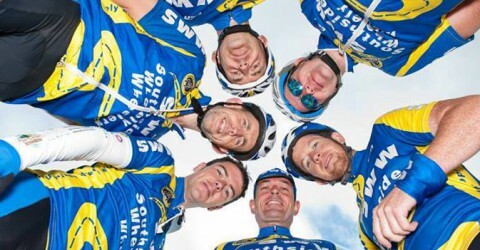 Election of new committee members and SWW club members can register for a Cycling Licence for 2012 on the night to ensure you are insured from 1st Jan 2012. Please make every effort to attend. Bag Packing Weekend for Underage Cycling and Leisure Tour planned in 2012. SWW. 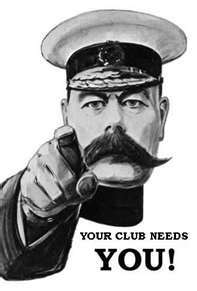 Your Club needs you! We have arranged a bag packing weekend in SuperValu Kilmallock Friday 16th December and Saturday 17th December from 10am to 5pm each day. Our club needs funds to promote Underage Cycling and we plan to run a Leisure Tour in July 2012. It would be great to have 3 people packing doing 2 hours each. Your 2 hours will go along way in helping our underage cycling club and it would be great to have some of our club underage cyclists and parents helping and supporting to raise funding foe underage cycling. Text Paul with the hours and day you can attend. Wednesday Night Light Cycle 7th Dec 2011. 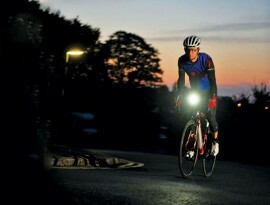 Wednesday Night Light Cycle was a hugh success with 3 groups our enjoying the thrill of night cycling. The evening was cool but the pace was hot as cyclists completed laps of the Kilmallock Quarry Hill circuit in dry cool but enjoyable cycling conditions. Next Wednesday 14th December will be our last Wednesday Night Light cycle before Christmas. We would like to thank all the Wednesday Night Riders for cycling every Wednesday evening and making night cycling fun, we hope to restart in the new year. Weekend Cycling 3rd and 4th December 2011. Saturday December 3 Southside Wheely Wheelers had two groups out cycling, one group met at 8am and the second group met at the later time of 9.30am. Out cycling were Pat O Donnell, David Kelly, Owen Tobin, Mike Sexton, John Carey and Brendan Daly took on the challenge of the three mountains. Jerry Ryan and Robert Shanahan took on the challenge of cycling to Castletown in the wheely cold wintery weather. Underage Cycling: Underage cycling continued on Saturday December 3 at 3pm. Cyclists and instructors met at our usual meeting place for training at the car park next to Kilmallock Cycles. Instructors continued with the basic modern cycling skills and techniques including speed work on their bicycles. Wheely well done to our young club cyclists Mark Mullins, Aishling Murphy, Sarah Herbert, Ronan Passmore, Aaron Passmore, Brian McCarthy, Cian Lynch, Eoin Murphy, Michael Gammell , Colm Hayes , Eve Ryan, Jack Kelly and Jamie Harte. We would like to thank this week’s club cycling instructors Owen Tobin, Tadgh Murphy, Mike Gammell, Jimmy McCarthy Underage cycling continues Saturday December 10 at 3pm. Sunday December 4 at 8.30am cyclists met at the car park next to Kilmallock Cycles. It was great to get out early Sunday morning to have a wheely great cycle with no rain falling or water splashing from our wheels. Out enjoying the training cycle was Willie McCarthy, Aaron Walsh, David Walsh, Stephen Finn, Will Wheelan, John Carey, Shane O’Brien, Gerard Finn, Pat O’Donnell, Owen Tobin, Donal Kelly, Brendan Houlihan and Paul Gammell. Group 2 Hospital, Caherconlish, Ballyneety, Bruff and home, Group 1 continued on from Caherconlish to Beary’s Cross to Tipperary and home. Well done all. All new cyclists are very welcome to join us enjoying cycling at a steady, leisurely pace and you can choose a group that you feel comfortable cycling in and we also cater for the competitive cyclist. New cyclists are always made feel very welcome to our club spins and we cater for all levels. All you need is a bike, a helmet and lots of enthusiasm. Weekly Training: Super Saturday Cycle at 8am and 9.30am. Sunday cycle at 8.30am and Wednesday Night Light Cycle at 6.30pm, Underage cycle this Saturday at 3pm. all meet at the car park next to Kilmallock Cycles.